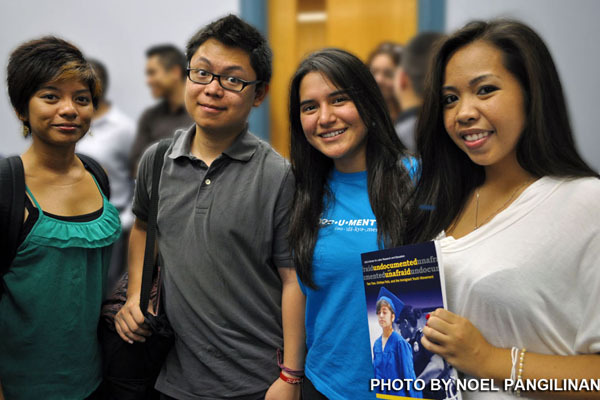 From left: Bea Sabino, chair of AnakBayan-New Jersey, Yves Nibungco, national chairman of AnakBayan-USA, with Sofia Campos, national chairman of United We DREAM, and AnakBayan-NJ’s Julia Reyes at a recent forum on undocumented youth at Rutgers University in New Jersey. Bea Sabino, 21, manned the registration table with other members of the organizing committee while Yves Nibungco, 24, gave instructions to members of the technical staff as they rushed to prepare the stage for the forum. Across the Hudson and East Rivers in Queens, NY a couple of weeks later, another young Filipino American, Matthew Cheirs, 25, welcomed young immigrants and immigration reform advocates to another forum on the same topic – President Obama’s DACA initiative. Hundreds of thousands of undocumented immigrant youth in New York, New Jersey, Los Angeles, Miami, Boston, Houston, and other cities have already filed applications for deportation relief and permits to temporarily stay and work in the U.S.
None of the three, however, will be filing an application. They don’t have to: Sabino and Nibungco came to the U.S. with proper immigration documentation; Cheirs, for his part, was born in the U.S. Yet, all three of them are actively involved in the campaign to help undocumented immigrant youth fight for the right to stay, study and live in the United States. All three are staunch advocates for a comprehensive overhaul of the U.S. immigration system. 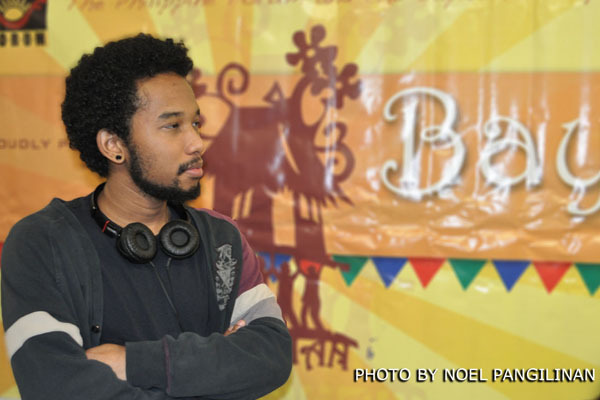 Matthew Cheirs, chairman of AnakBayan-New York at the Bayanihan Festival in Queens, NY in early October. “You can say this is our global bayanihan,” Cheirs, chairman of AnakBayan-New York, said after the forum in Queens. “This is the spirit of community,” he said. Cheirs, who was born in New York to a Filipina mother and an American father, said he became familiar with the Filipino word “bayanihan” because of his involvement as youth coordinator for the Bayanihan Filipino Community Center in Woodside, Queens. Several Filipino organizations and those from other immigrant groups consider the community center as their home base. “No human is illegal and we all have our rights to pursue our dreams,” Nibungco, who grew up in Navotas, said. Sabino, chair of AnakBayan-New Jersey, said her own experience as an immigrant in the U.S. motivated her to campaign for immigrant rights. She was 15 when she came to the U.S. after her mother petitioned for her, her father and her sibling. Despite having the necessary papers, Sabino, who hails from Antipolo, said the difficulty of acquiring a legal permanent resident (LPR) status or green card made her identify with those who are in the country illegally. “I have always thought of myself as being this close to being a DREAMer and being undocumented,” she said, bringing her thumb and index finger close together to illustrate her point. The DACA, which took effect on Aug. 15, is widely seen as a stopgap measure to bridge the failure of the Obama administration to fix the broken immigration system or at least pass the DREAM Act. Under the DACA program, two-year permits to stay and work in the U.S. are issued to immigrants who came to the U.S. under the age of 16, who must be under 31 as of June 15 and must have been in the U.S. for at least five years. Eligible youth must also be in school or have graduated college, and must not have been convicted of certain crimes. More than 1.7 million children and young adults are expected to benefit from this deferred deportation program, according to the Migration Policy Institute. As of Nov. 15, however, only 53,273 out of about 308,935 applications have been approved, according to the U.S. Citizenship and Immigration Services (USCIS). Among those expected to benefit from deferred deportation are Filipinos. The Department of Homeland Security said in a 2011 report that Filipinos have the fifth largest illegal population in the U.S. As much as 280,000 Filipinos are said to be staying in the U.S. illegally. As of Nov. 15, however, only 2,613 Filipino youth have applied for DACA, according to USCIS data. A major factor for the slow turn-in of applications among immigrant youth who have been living in the shadows is the fact that DACA is just a temporary measure. He believes the only way to solve the problem is to legalize all the immigrants. Nibungco said DACA was a political maneuver of the Obama administration to garner support from the immigrant population. Despite pointing out DACA’s shortcomings though, all three agree that it is still a positive step. “I would encourage young immigrants to apply, but I would remind them that it’s not a permanent solution,” Cheirs said. Sabino agrees. “Young people should apply as long as they take the proper precaution,” she said. For these young idealist leaders, this current expression of “global bayanihan” is the Filipino American youth’s contribution to the growing international solidarity movement among various immigrant groups.